If we had a dollar for every new restaurant opening in NYC we'd have — well, a whole lotta dollars. Luckily, though, we don't need a ton of expendable cash to indulge at The Lobster Joint, a New England-inspired clam shack in the LES. This tip-top seafood establishment brings a little Down East flavor to the isle of Manhattan (they have brick-and-mortar locations in Greenpoint and Rockaway, too!). The menu includes oysters, fried calamari, crab cakes, and, of course, lobster rolls, so you're guaranteed to get your fresh fish fix. We recommend keeping your look casual and comfortable with a bit of North East flair. 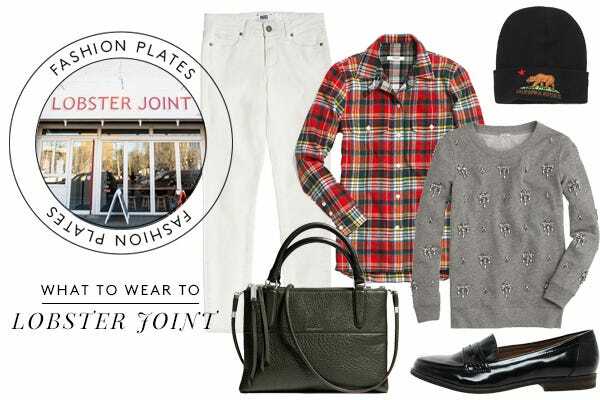 We love repurposing our summertime white jeans with a flannel and embellished sweatshirt for a laid back, collegiate look that's got a bit of polish. Want more new restaurant and matching outfit suggestions? Watch our New York editor on New York LIVE talking all things fashion and food! Clockwise from top left: Paige Skyline Ankle Peg Jean, $185, available at Calypso St. Barth; Madewell Ex-Boyfriend Flannel Shirt, $79.50, available at Madewell; Pac Sun With Love From CA Beanie, $14.95, available at Pac Sun; J.Crew Jeweled Chandelier Sweatshirt, $168, available at J.Crew; London Rebel Flat Loafer, $49.83, available at ASOS; Coach Mini Borough Bag, $378, available at Coach.